A recent series of articles from the Portland Press Herald (see Payday at the Mill and Shrewd Financiers Exploit Unsophisticated Maine Legislators) is bringing new attention to the complex system of state level New Markets Tax Credits (NMTC). 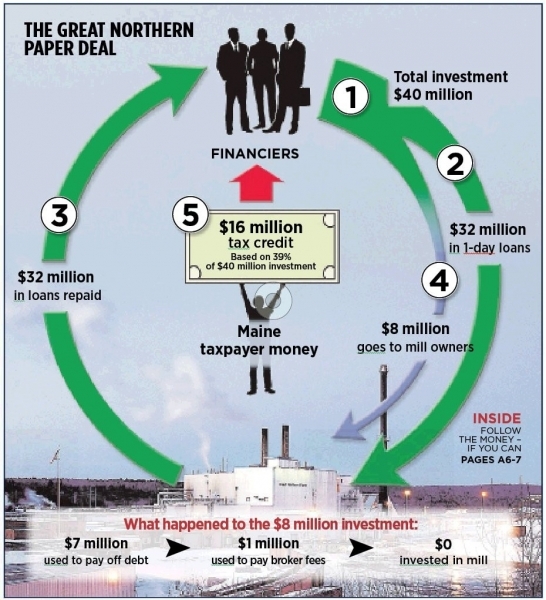 Whit Richardson’s reporting exposes how a NMTC deal that was intended to upgrade the Great Northern Paper mill in East Millinocket, Maine was exploited by out-of-state investment firms using complex financial tools. In the end, $8 million was expended on debt payments and fees with no investment made in the mill itself. A one-day loan for $32 million artificially inflated the investment to a total of $40 million, allowing the investors to cash in on a $16 million tax credit (at 39% of the total investment) payable by the state of Maine over the next 7 years. The Federal NMTC program states the intent of the program as “the creation of jobs and material improvement in the lives of residents of low-income communities.” Many states, like Maine, have in recent years created state level NMTC programs, driven largely by the lobbying efforts of a handful of investment firms that benefit from these deals. And as the Maine case strongly shows, it seems it is these very firms that are benefitting from the state NMTCs, not low-income communities or the businesses that serve them. In the weeks since Richardson’s piece legislators and others have been pushing to attach greater accountability measures to the NMTC program.